You could argue that September’s biggest release was Destiny 2, but for a lot of gamers Nintendo claims that spot with the first new Metroid game in years. The beloved series started on the original NES back in 1986 and helped redefine the action game, but hasn’t been seen in nearly a decade. Metroid: Samus Returns hits Nintendo’s 3DS with a bang and reminds us why Samus Aran will always be the first lady of gaming. Samus started off innocuously enough. In the original game, you had no idea who was underneath that powerful suit of sci-fi armor, but the odds are, most people who played it assumed they were controlling a male character. So, when Samus was revealed to be a woman by taking off her helmet at the end of Metroid, it was just one more great surprise in an already fantastic game. And then people discovered that you could strip her right down to her bikini underwear and the progressive feminist celebration over having a badass woman in gaming diminished. 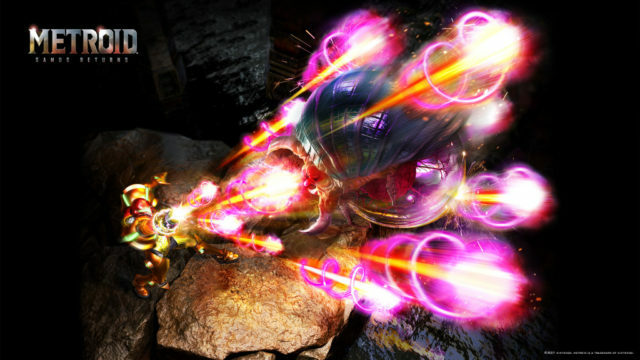 Samus’s design has changed over the years, as her appearances moved up to more powerful systems, going from the primitive side-scrolling 2-D of the early game to full-on 3-D first-person shooting on the Gamecube and Wii with the Metroid Primeseries. But the heart of the series has always been its side-scrolling retro roots, and Nintendo has fully embraced that philosophy in Samus Returns. Strictly speaking, this isn’t a new Metroid game, but a reimagining of Metroid II: Return of Samus, released in 1991 on the original black-and-white Gameboy. The game manages to feel brand new and retro at the same time, though, and Nintendo has pulled out all the stops to welcome Samus back. They’re releasing a special-edition Metroid-themed 3DS for the occasion and a two-pack of special Amiibo figures for the game. These Amiibos are so absurdly detailed that even grown-up players who’d never think to buy toys might not mind them on their shelves. The model shows off just how much Samus’ armored look has changed. Evolving out of the ‘90s, the suit got more and more form-fitting. Then, the “Zero” suit was introduced, replacing her ’80s/early ’90s-era underwear as the under-armor garment of choice. This skin-tight blue full-body suit managed to show off all her impressive assets without actually showing any skin, so it’s a marginal step up from the old NES code to play as Samus in a bikini. She even showed up in this suit (and, oddly, a lot less) in Nintendo’s beloved brawler Super Smash Bros. Beyond undergarments, her armor got more feminine, too—rounding out the rough edges, losing bulk, and making sure to show off a small waist and tight bottom. Samus Returns takes a more classic approach. The suit in the new game isn’t as tank-like as earlier models, but gets more than a little metal thanks to its more jagged lines and spike-like knee covers that look positively menacing. One thing that hasn’t changed over the years is that Samus has always been and remains an absolute badass. Exploring and shooting through the amazingly gorgeous and detailed new cave systems of this revamped Metroid II, it’s impossible not to be reminded in vivid detail why the series and Samus are so beloved. Metroid (along with another NES classic, Castlevania) created a whole new style of play, where exploration was key. Far from the other linear, straightforward action games of the time, Metroid required us to solve puzzles, earn new abilities, and find ways to overcome previously impenetrable obstacles. Spending more hours with Samus in even just a re-do of an old game is easily one of the highlights of this year in gaming and hopefully the start of a whole new era for the heroine. Samus might have changed over the years, but our love for her remains a constant.